Starting at the top, take a second to look at your collar. Is your undershirt visible? The days of undershirts are over. No undershirt needed. Can you see your tie sticking out at the back of your neck? Your tie could be too big or your collar could be too small. Are you able to fit more than one finger between your collar and your neck? It’s too big – pick a smaller size. Are your lapels more than three inches wide? That hasn’t been a trend in years; it’s time to update your jacket. If your shirt bulges and sticks out in strange places when you tuck it in, opt for a slim-fit shirt. Does the bottom of your jacket fall below your fingertips? It’s too long, shorten it. If your sleeves fall above your wrists they’re too short, but below them is too long. They also need to exceed the length of the jacket’s sleeves by half an inch. If the lengths are off, then tailor the necessary parts. Check your sleeves to make sure labels are removed, and cut the thread on the pockets and the back vent. Be careful with French cuffs, and if you don’t know how to style them you should probably skip them altogether. Make sure that your pants aren’t too long. You’ll ruin the bottoms of them by the end of the day, and they look messy. Don’t cuff your dress pants – this visually shortens the leg and often appears floppy. Too-short pants will show your ankle and appear ill-fitting. You also want to avoid pleated pants, as they have long given way to their contemporary counterpart, the flat-front pant. Aesthetically, men often fall into the trap of only sporting black suits. While this is a classic look, it’s better off reserved for occasions like weddings or funerals. There are plenty of classic grey or navy options that are just as versatile as black. Men feeling a little bolder can play with patterns, and we know where you can pick through thousands of pieces of fabric to find your dream ensemble. 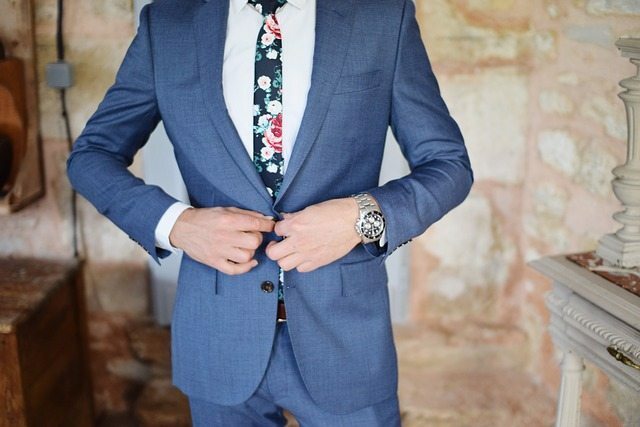 You can avoid every single one of these mistakes when you book an appointment with us and learn to take control of your suit style.